Rep. Trey Gowdy (R-SC), appearing alongside Rep. John Ratcliffe (R-TX) on the Fox News Channel program The Story with Martha MacCallum Monday night, spoke about an FBI text message that then-FBI Director James Comey “was going to update the President of the United States about an investigation.” Gowdy implied the message was from the Fall of 2016 but that he did not know if the update was about the Clinton or Trump investigations. However, Gowdy seemed to indicate it was about one or the other presidential candidates. Either way Gowdy said he found it “interesting” that Comey planned on updating President Barack Obama about an investigation. The text was part of the the latest batch of an estimated 50,000 messages between Trump-hating FBI officials Peter Strzok and Lisa Page who were engaged in an adulterous affair as they investigated President Donald Trump. Ratcliffe told MacCallum there was talk by the FBI couple of an anti-Trump “secret society” within the FBI and Justice Department (Link to report by TGP’s Cristina Laila). The Inspector General recently discovered that the FBI lost five months worth of texts by Page and Strzok between December 14, 2016 and May 17, 2017. Gowdy’s suspicions appear to be correct as Comey did not disclose updating Obama in the Fall of 2016 about an investigation into either candiate when he testified before the Senate last year. Comey testified his direct interactions with Obama were rare. Transcript of Gowdy’s comment Monday night (transcribed by Kristinn Taylor). SEN. MARK WARNER (D-VA): And so in all your experience, this was the only president that you felt like in every meeting you needed to document because at some point, using your words, he might put out a non-truthful representation of that meeting. COMEY: That’s right, senator. As I said, as FBI director I interacted with President Obama, I spoke only twice in three years, and didn’t document it. When I was Deputy Attorney General I had a one one-on-one with President Bush been I sent an email to my staff but I didn’t feel with president bush the need to document it in that I way. Again, because of the combination of those factors, just wasn’t present with either President Bush or President Obama. …SEN. MARTIN HEINRICH (D-NM): Mr. Comey, prior to January 27th of this year, have you ever had a one-on-one meeting or a private dinner with a president of the United States? COMEY: No. Dinner, no. I had two one-on-ones with President Obama. One to talk about law enforcement issues, law enforcement and race, which was an important topic throughout for me and for the president. Then once very briefly for him to say goodbye. COMEY: No. The one about law enforcement and race and policing, we spoke for probably over an hour, just the two of us. …HEINRICH: Did the president in any of those interactions that you’ve shared with us today ask you what you should be doing or what our government should be doing or the intelligence community to protect America against Russian interference in our election system? COMEY: Not with President Trump. …COTTON: You said you did not record your conversations with President Obama or President Bush in memos. Did you do so with Attorney General Jeff Sessions or any other senior member of the trump Department of Justice? COMEY: No. I think — I am sorry. COTTON: Did you record conversations or memos with the attorney general or any other senior member of the Obama administration? 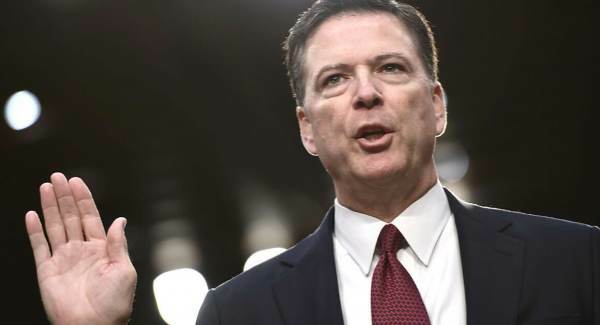 There is no mention in the testimony by Comey of him briefing President Obama about the Clinton or Trump investigations, only participating in meetings with Obama and others about Russia’s interference in the 2016 election.